SANTA FE - Mrs. Juanita Grace Lodwick passed from this life Monday morning, September 10, 2018, in Houston. Born January 27, 1932 in Athens, Ohio, Mrs. Lodwick had been a resident of Santa Fe and Galveston since 1990. She worked as a seamstress, a butcher and on a horse ranch. She was an accomplished artist and a proud mother. She was preceded in death by her parents, John Russell and Milly Margaret (Stanton) Bolin; sons, Richard and Gregory Lodwick; brother, Larry Ray Bolin; sisters, Esther Parker, Irene Smith. 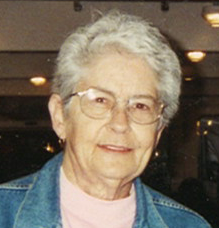 Survivors include her son, James Robert Lodwick; daughter, Diane Elaine Roush and husband, Donald Curtis; sisters, Leota Krautter, Helen Louise Swick; grandchildren, Jeffrey Roush, Michael Roush, Sarah Christine Lodwick, James Travis Lodwick, Kasandra Jean Lodwick; great grandchildren, Brandon, Brittany and Chelsea.